But in the meantime, as I’ve just re-released my second-ever Python book as an e-book, I thought I’d explain how it all came about. No one was more amazed than I was (unless it was my agent or my publisher) when my first book was released in late 1989. The First 200 Years of Monty Python sold amazingly well. Graham Chapman had passed away a few weeks before, the day before the Pythons had observed their 20th anniversary (in what Terry Jones had called “the worst case of party-pooping I’ve ever heard of”), so perhaps Python was on peoples’ minds more than usual. And so, my editor and agent both approached me, basically saying “So what else have you got, Python-wise?” The problem was that I had thrown just about everything but the kitchen sink into the first book. John Cleese suggested I write a book on the solo projects of the various Pythons, but my editor and my agent weren’t terribly excited at the idea. I knew that a book like that would take a while to do right, so I tried to come up with an idea for something I could write rather quickly and painlessly. 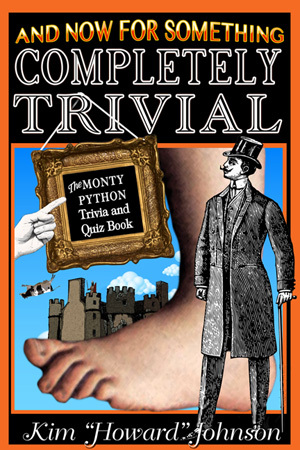 I thought about a quiz book, and I thought about a trivia book. There probably wasn’t enough material for either idea, so I thought I could combine the two and have a very nice, informative volume that I could turn out quickly and easily. But I soon came to realize that if I was going to put together a list of each time one of them appeared as a Gumby, or performed in drag, or named a character Ken or Arthur, I was going to have to go back and watch every show several times, in great detail, stopping and starting the VHS copies that were all that existed then. It was not quick and easy. But by the time I had finished, I had a compilation of Python data that amazed even me. Of course, it took nearly as long to write as did my first book, but it was well worth it. It sold respectably well, well enough for my editor to ask for another Python book. And I went on to write a third book, on the solo projects of the Pythons, just as John had very wisely suggested. But And Now For Something Completely Trivial was allowed to go out of print after that one printing. Seemed kind of a shame, and over the years I always thought it’d be nice to bring it back into print. And so now, over twenty years later, it’s back. If you buy it, I think you’ll enjoy reading it even more than I enjoyed writing it. This entry was posted in Uncategorized and tagged And Now For Something Completely trivial, John Cleese, Michael Palin, Monty Python, The First 280 Years of Monty Python on November 24, 2013 by howardjohnson1985. Spiffy crew though don’t you think?